Monday: Sun mixes with wispy clouds. Cool, highs in the 40s. Overnight Monday: Clouds thicken, lows around 30. Tuesday: Cloudy with sprinkles and flurries. Highs in the 40s. 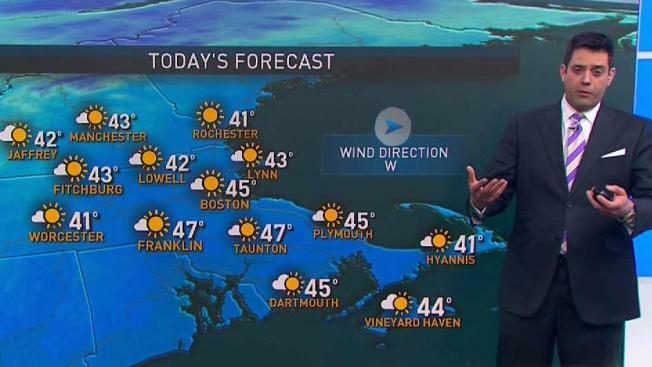 It will be mostly sunny today with temperatures in the 40s, which is unseasonably cool. The next 10 days will remain fairly unsettled. Shower chances are possible most days. On Tuesday, a warm front will be lifting through the region. Showers are possible during the day. Wednesday will likely be dry, but showers are likely from Thursday all the way through Marathon Monday. The heaviest rain of the stretch may coincide with the marathon, but hopefully it will hold off until Monday afternoon or evening. It’s hard to imagine that parts of New England climbed into the 80s in February (even at the coast, we experienced back to back days in the 70s) — fast-forward to April, it’s been a challenge getting out of the 40s.